Tonight the lobby of the Viscount Suites midtown hotel erupted with chants of "Lea! Lea! Lea!" 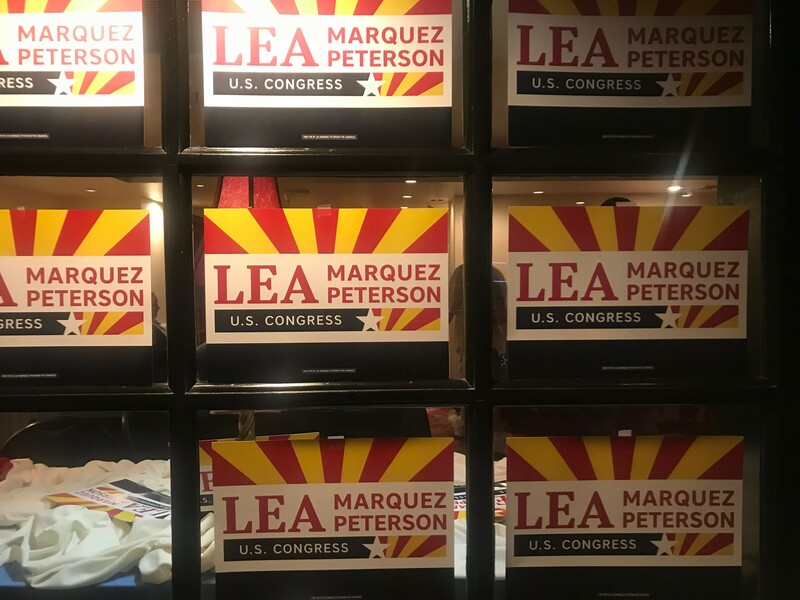 as Republican Congressional District 2 candidate Lea Marquez Peterson hosted a primary election watch party. She and more 100 supporters spent the next few hours watching poll numbers trickle in on the Arizona Secretary of State's website. But as of 11 p.m., only 17 percent of the precincts have reported results. Marquez Peterson leads her primary for the open seat left behind by Rep. Martha McSally (who just won her primary for U.S. Senate) with about 33 percent, while her opponent Brandon Martin trails closely behind with 29 percent. With an unknown number of ballots still remaining to be counted, the race is too close to call but Peterson is the favorite to win. Candidates Casey Welch and Brandon Martin are trailing behind at 22 percent and 16 percent, respectively. At her watch party, Peterson said she was confident the race would go her way and she's ready face Ann Kirkpatrick, who won the Democratic primary by 6,305 votes. "This is going to be a huge battle to keep CD2 Republican and pro business," said Marquez Peterson, who is president and CEO of the Tucson Hispanic Chamber of Commerce. "I understand the economy of Cochise County, Pima County and what it's going to take to really revitalize and to work with businesses throughout the region, and [Kirkpatrick] doesn't because she's from Flagstaff." Her plan if she wins tonight: "We've got a whole group of folks that are knocking on doors and making phone calls and that's what we did every day through the primary, and we're going to be doing that in the general, assuming I win tonight. That starts early tomorrow morning."